Mendelson's Memos: Review: Tony Kaye's Detachment (2012) paints a grim picture of public education. 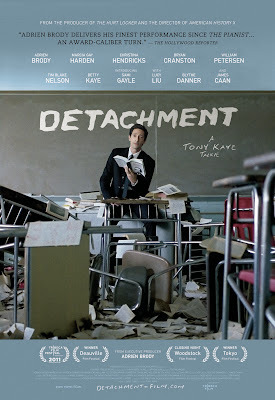 Review: Tony Kaye's Detachment (2012) paints a grim picture of public education. 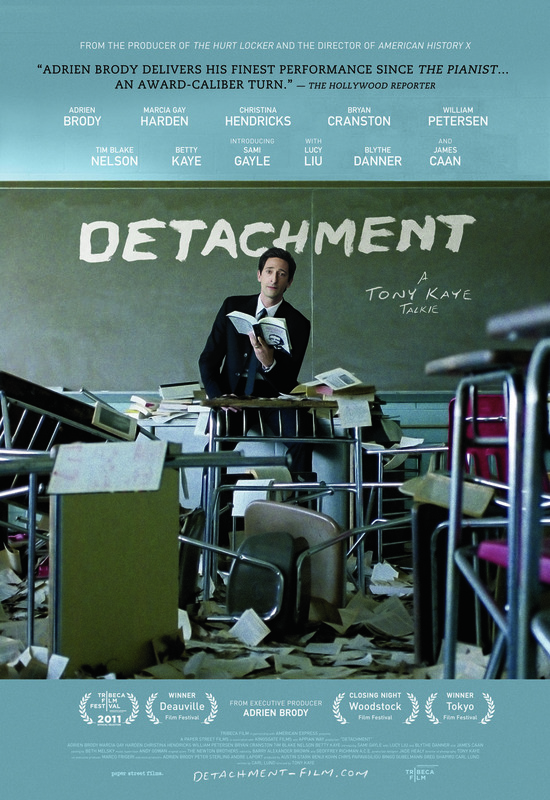 Most of the ideas in Tony Kaye's Detachment are not revolutionary, especially not to anyone who has followed the last thirty years of debate regarding the public education system in America (Jonathan Kozel's many works of nonfiction come to mind). And while the story is told in a style that sometimes veers in art-house cliche (sepia-toned flashbacks, first-person testimonial to an unseen listener, hand-held claustrophobia, etc), the picture is in the end devastating via its almost objective presentation of the issues at hand. Sure, Kaye is saying, we know that public schools are underfunded, understaffed, and stuck with various federal mandates and (worst of all, argues Kaye) a deluge of unmotivated students whose parents only take an interest when it comes to rebutting disciplinary measures. But told through the eyes of a substitute teacher who is far more caring than he wants to be, the picture wonders why we're so accepting a system that doesn't seem to be all that successful for any number of American youths. The plot is pretty simple: Henry Barthes (Adrien Brody) is starting an extended gig as a substitute teacher in an unnamed public high school. Through his eyes we see the frustration, bitterness, cynicism, and acceptance of his full-time colleagues (played by, among others, James Caan, Lucy Liu, Christina Hendricks, and William Peterson, Blythe Danner, Tim Blake Nelson, and Marcia Gay Harden). 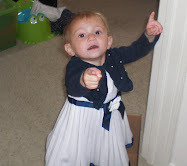 The primary blame is placed at the feet of seemingly disinterested parents, although programs like No Child Left Behind with its unfunded mandates and reliance on arbitrary test scores as the be all/end all judgement for struggling schools, takes their licks too. Yes Mr. Barnes does provide token inspiration to his kids, almost despite himself, but it's merely because they take his blunt cynicism as a sign of respect. This is, at its core, a character study of someone who has long since given up being the great inspiration to young minds, as well as a brutal deconstruction of that entire concept. Much of what happens borders on cliche, especially when the film leaves the classroom. He struggles with a student who mistakes simple empathy for paternal/romantic affection, bonds with a female member of the faculty, and deals with a dementia-stricken grandparent (Louis Zorich). But the film works because of the sheer understated power of its frank storytelling. That last subplot plays out in a stunningly powerful fashion, as Brody's best scene involves offering a token amount of absolution to the dying old man that he really has no business providing. Even the most absurd thread, which sees the overly compassionate educator basically adopting a child prostitute he meets on the street, plays out with an absolute lack of melodrama and ends in a refreshingly realistic fashion. Adrien Brody is terrific throughout, anchoring the picture with a precise portrait of a man who doesn't particularly want to save the world, but finds himself so weighed down by his own misery that he occasionally steps up almost by accident. The film doesn't break any new ground thematically, but that's kind of the point. We are no longer shocked by the various flaws in the system we use to educate our youngsters and yet we constantly take offense at the idea that so many young people seem to have misplaced priorities and/or don't feel that they are valued by society at large. What sticks with you are individual moments. Isiah Whitlock Jr. has a blistering scene as a bureaucrat lecturing the faculty about how low test scores are only important because they decrease property values. Brody has a wonderful bit in the second act where he explicitly lays out why his young charges should actually give a damn about their own education. And Lucy Liu has one of the best scenes of her career when she finally explodes at a young girl whose only ambition is to hang out with her boyfriend and 'do some modeling'. The film loses a few points due to allow Hendricks's character to serve primarily as a romantic foil, and then allow her to make a rather inexplicable judgment call, as well as a climax that feels the need to bring finality to a story that shouldn't have a natural 'conclusion'. But overall, Detachment works as a powerful character study and a searing indictment of the institutional disinterest in education that allows seemingly dedicated educators to eventually become as much a problem as a solution. Whether taken as gospel or inflated allegory, Detachment is a powerful piece of art. Awesome review - my favorite part: The film doesn't break any new ground thematically, but that's kind of the point. We are no longer shocked by the various flaws in the system we use to educate our youngsters and yet we constantly take offense at the idea that so many young people seem to have misplaced priorities and/or don't feel that they are valued by society at large. Thank you, Scott for this review. A little late to the party but I was searching Vudu for some substance in the wake of disappointing summer season at the movies and happen upon this review. And like your review of 13 Assassins last year, it has guided me to a beauty of a film. As you said, nothing new in terms of ideas but it's the frankness of the film that destroys you. Best film I've seen all year, bar none.